Reduced fat spread (45%) made with a blend of vegetable oils and olive oil (21%). 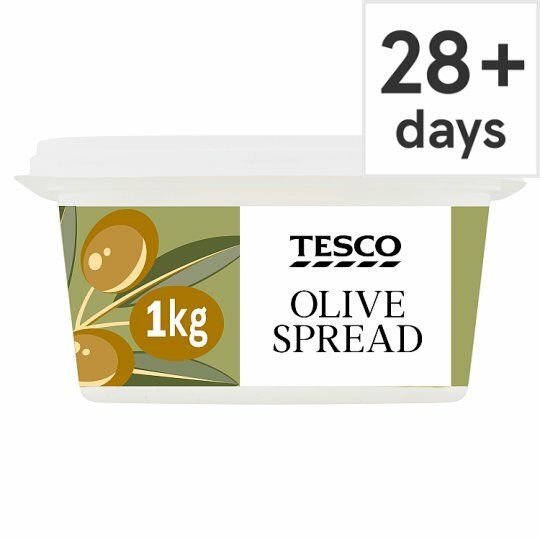 Reduced fat spread (45%) made with a blend of vegetable oils and olive oil (21%), Suitable for Spreading, Home Freezing, Shallow Frying, Baking, Sauces, Source of Vitamins B6, B12 and Folic Acid, Suitable for vegetarians, Delicious on crumpets, bread, potatoes, vegetables. Water, Olive Oil (21%), Rapeseed Oil, Palm Oil, Salt (1.1%), Whey Powder (Milk), Emulsifiers (Mono- And Di-Glycerides Of Fatty Acids, Sunflower Lecithins), Stabiliser (Sodium Alginate), Preservative (Potassium Sorbate), Lactic Acid, Colour (Carotenes), Flavouring, Vitamin B6, Vitamin B12, Vitamin A, Folic Acid, Vitamin D.
Suitable for home freezing. Ideally freeze as soon as possible after purchase but always by the date shown.